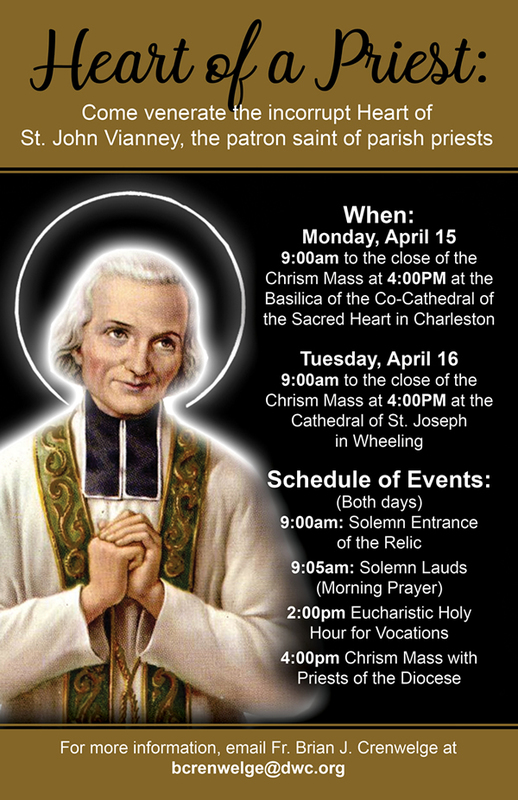 A major relic of St. John Vianney, the Curé of Ars, patron saint of parish priests, will be in West Virginia during Holy Week. The saint’s incorrupt heart will be present for the celebration of Chrism Masses in both Wheeling and Charleston, and will be available for veneration. The relic is contained in a special casing, and will be visible to the faithful. The relic’s visit to West Virginia is part of a national pilgrimage throughout the U.S. sponsored by the Knights of Columbus Supreme Council. The pilgrimage began in November and will culminate in the spring. Auxiliary Bishop William J. Waltersheid of the Diocese of Pittsburgh will celebrate the Chrism Mass at the Basilica of the Co-Cathedral of the Sacred Heart in Charleston on Monday, April 15, at 4 p.m. Archbishop William E. Lori of Baltimore and apostolic administrator of Wheeling-Charleston will celebrate the Chrism Mass at the Cathedral of St. Joseph in Wheeling on Tuesday, April 16, at 4 p.m. The relic’s presence during the Chrism Masses is especially fitting as these celebrations gather priests from across the diocese for the blessing of the holy oils — gathering the priests of the northern and eastern parts of the state at the Cathedral, and the priests of the central and southern regions at the Basilica Co-cathedral. Father Crenwelge encourages all to attend these beautiful Masses. The relic’s times of arrival in Wheeling and Charleston have not yet been determined, but Father Crenwelge said that more information will be announced in the coming weeks. St. John Vianney, popularly known as the Curé of Ars, is revered as a model of priestly generosity, purity and prayerfulness. Born in France in 1786, he grew up in a time of open hostility to the Church in the wake of the French Revolution when the faith was attacked, churches destroyed, and the clergy martyred. Assigned to lead the parish in the small farming community of Ars, Father Vianney excelled at both prayer and work. In Catholic tradition, a relic is a physical object associated with a saint that may be offered to the faithful for veneration. Neither the relic nor the saint are to be worshipped, but are rather venerated as holy objects in recognition of the fact that God has worked through the saint. A major or first-class relic was part of the saint’s body as opposed to something that the saint touched or wore. The term “incorrupt” refers to a human body that has avoided the normal process of decomposition after death. It is a sign — but not a proof — of the person’s holiness, and is sometimes seen in Catholic saints and blesseds.